A composite image of the Bullet Cluster, a much-studied pair of galaxy clusters that have collided head on. One has passed through the other, like a bullet traveling through an apple, and is thought to show clear signs of dark matter (blue) separated from hot gases (pink). Two Canadian astronomers think there is a good reason dark matter, a mysterious substance thought to make up the bulk of matter in the universe, has never been directly detected: It doesn't exist. Dark matter was invoked to explain how galaxies stick together. The visible matter alone in galaxies—stars, gas and dust—is nowhere near enough to hold them together, so scientists reasoned there must be something invisible that exerts gravity and is central to all galaxies. 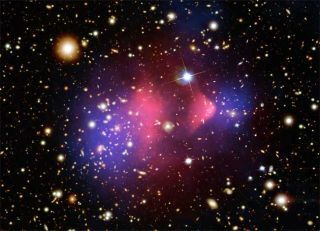 Last August, an astronomer at the University of Arizona at Tucson and his colleagues reported that a collision between two huge clusters of galaxies 3 billion light-years away, known as the Bullet Cluster, had caused clouds of dark matter to separate from normal matter. Many scientists said the observations were proof of dark matter's existence and a serious blow for alternative explanations aiming to do away with dark matter with modified theories of gravity. Now John Moffat, an astronomer at the University of Waterloo in Canada, and Joel Brownstein, his graduate student, say those announcements were premature. In a study detailed in the Nov. 21 issue of the Monthly Notices of the Royal Astronomical Society, the pair says their Modified Gravity (MOG) theory can explain the Bullet Cluster observation. MOG differs from other modified gravity theories in its details, but is similar in that it predict that the force of gravity changes with distance. "MOG gravity is stronger if you go out from the center of the galaxy than it is in Newtonian gravity," Moffat explained. "The stronger gravity mimics what dark matter does. With dark matter, you take Einstein and Newtonian gravity and you shovel in more dark matter. If there's more matter, you get more gravity. Whereas for me, I say dark matter doesn't exist. It's the gravity that's changed." Using images of the Bullet Cluster made by the Hubble, Chandra X-ray and Spitzer space telescopes and the Magellan telescope in Chile, the scientists analyzed the way the cluster's gravity bent light from a background galaxy—an effect known as gravity lensing. The pair concluded that dark matter was not necessary to explain the results. "Using Modified Gravity theory, the 'normal' matter in the Bullet Cluster is enough to account for the observed gravitational lensing effect," Brownstein said. "Continuing the search for and then analyzing other merging clusters of galaxies will help us decide whether dark matter or MOG theory offers the best explanation for the large scale structure of the universe." Moffat compares the modern interest with dark matter to the insistence by scientists in the early 20th century on the existence of a "luminiferous ether," a hypothetical substance thought to fill the universe and through which light waves were thought to propagate. "They saw a glimpse of special relativity, but they weren't willing to give up the ether," Moffat told SPACE.com. "Then Einstein came along and said we don't need the ether. The rest was history." Douglas Clowe, the lead astronomer of the team that linked the Bullet Cluster observations with dark matter (and now at Ohio University), says he still stands by his original claim. For him and many other astronomers, conjuring up new particles that might account for dark matter is more palatable than turning a fundamental theory of how the univese works on its head. "As far as we're concerned, [Moffat] hasn't done anything that makes us retract our earlier statement that the Bullet Cluster shows us that we have to have dark matter," Clowe said. "We're still open to modifying gravity to reduce the amount of dark matter, but we're pretty sure that you have to have most of the mass of the universe still in some form of dark matter."